Josie started piano lessons back in January. 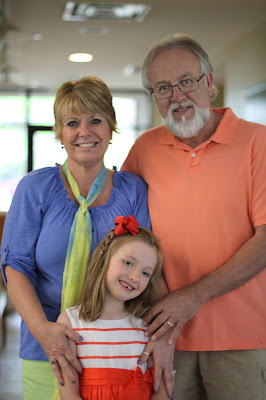 We are so impressed by how much she has learned in such a short amount of time. 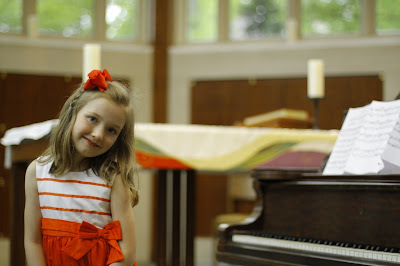 Her first recital was Sunday at The Episcopal Church of the Redeemer in Hyde Park. We are so proud of her! She played two pieces from memory - "Old Pig Donald" and "Jungle Wedding." Great work Sweet Josie Marie! Special thanks to Grandma & DD for coming to the big show (although, let's be honest, they wouldn't have missed it for the world). Looks like Josie got your skills on the ivories DD! What an amazing little girl you are, Josephine! Lyla, "Wow that was good! What's the name of the song she is playing? I don't know it. Can you teach it to me? How did Josie learn that song? How did you get the video? Who sent it to you? Did Lou-Lou send it? Was Kiwi there to watch Josie? Who else was there? When can I start playing the piano like Josie, mama? Does baby Beeba know how to play the piano? When will she learn a song? Will Josie teach her or will she have another teacher? Can I watch it 3 more times? Will you tell Josie good job?" And then Lyla fell asleep...heart melting stuff sissy. I wish we were there to witness this special moment. We are SO thankful for video footage. XOXOX!